Export to CSV lets you create a CSV file from all the applications in the RES ONE Workspace Console. When you click on “Create applications CSV”, the Toolkit will automatically create a Building Block and then it will load the Building Block into memory and export it as a CSV file. 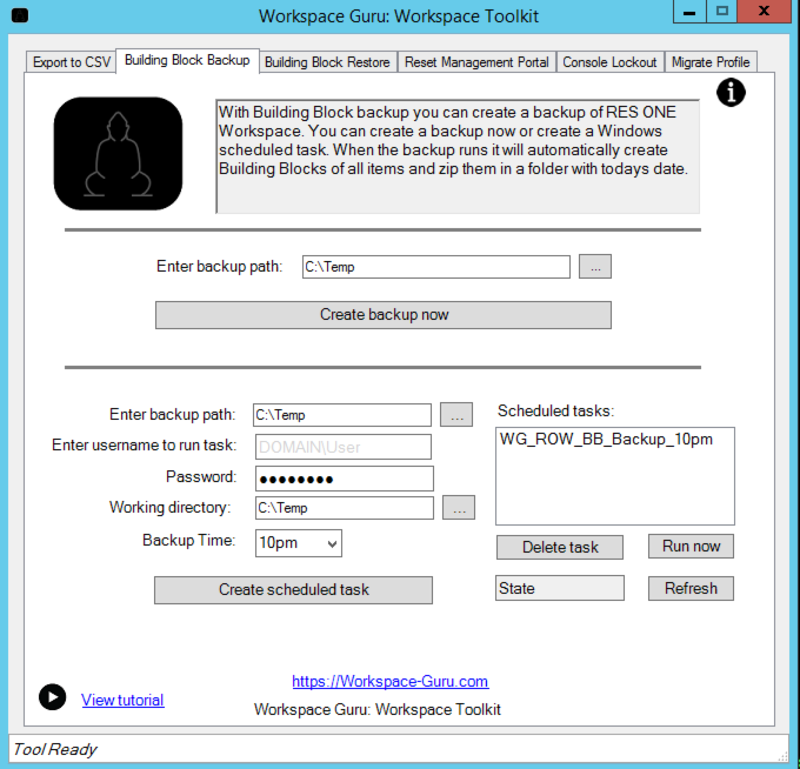 With Building Block backup you can create a backup of RES ONE Workspace. You can create a backup now or create a Windows scheduled task. When the backup runs it will automatically create Building Blocks of all items and zip them in a folder with today’s date. Restore Building Block lets you restore the .zip from Building Block Backup or lets you export one Building Block at a time. This tool is also useful for migrating from production to test environment. It can happen that you are locked out from RES ONE Workspace Console. By clicking on “Unlock RES ONE Workspace Console” it will be started in lockout mode. After that you can enter the database credentials and gain access to your environment. This tool will create a one time copy task command in the RES ONE Workspace under Execute Command. You can use this tool when migrating from one RES ONE Workspace environment to another. Run this tool in the new environment. You can also use this tool to merge different upr and upf files in one GUID. And to copy global profiles to application profiles. Using the tool is at your own risk. With this tool would it also be possible to copy over all applications and settings attached to 1 Workspace container to a second Workspace container leaving the first one intact ? We wanted to create a test Workspace container for our test environment but we have 2k+ apps to adjust. The functionality is not build in but you could use the tool kit to create a backup from all settings in xml files. Then open the files (which are only 15 files or so) and find and replace container name then import the xml’buildingblocks back into RES. Be careful with the import to create new GUIDS or else it will overwrite the settings. You can’t use the restore function of the tool because that will always overwrite.